Numerous changes, including the advent of ICD-10 and the expanded use of computer-assisted coding, promise to transform the profession in the next decade. By the year 2020, the U.S. healthcare industry will presumably have survived its drawn-out transition to ICD-10, and advanced HIT systems will be the norm rather than the exception. While these changes will transform the industry as a whole, perhaps no individual healthcare profession will be impacted as significantly as coding. Indeed, many HIM professionals agree that ICD-10 will inexorably alter the profession. The need for a higher level of clinical knowledge alone will change education requirements and, subsequently, the type of individual attracted to a career in coding. Although its impact will be significant, ICD-10 is far from the only healthcare initiative that will ultimately change what it means to be a professional coder. 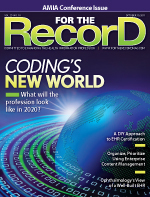 The move to the expanded code set is just one of several forces driving that change, joining accelerated EHR adoption, healthcare reform, and expanded use of computer-assisted coding (CAC) as the principal movers and shakers. Advances in technology and increased regulatory compliance are creating a new emphasis on both the speed and the accuracy of coding, in particular, as electronic records sharing expands to encompass healthcare facilities across the nation. Susan Proctor, RHIT, CCS, CPC, a trainer with the AHIMA Academy for ICD-10, concurs, noting that the advances made in information exchange and the increasingly critical role data plays in measuring quality outcomes to determine reimbursements are upping the ante in terms of the skills coders will need in the coming decade. Proctor says enough progress has been made toward the “grand scheme” of a fully electronic record that the industry is already seeing the first blush of changes, including the publication of quality report cards and the Centers for Medicare & Medicaid Services’ (CMS) decision to no longer pay for hospital-acquired conditions. These changes promise to reshape HIM and, in particular, coding. “If those other things weren’t in play, it wouldn’t matter about ICD-10 or even the change to electronic records,” Proctor says. “The capacity for electronic transmission has finally progressed enough so that this grand vision to collect clinical data and use it in very sophisticated ways can be executed. As a result, you will have to have a really impressive clinical understanding to be able to work in this new data collection environment and to crunch that data. Perhaps one of the biggest changes to the profession in the coming decade will be the transformation of coders into auditors, a development being driven in large part by the technical advances that are automating significant portions of the documentation and coding process. While CAC and other technologies may take over many of the actual coding functions, they won’t replace coders no matter how intuitive or advanced their programming may become, according to Jacqueline Thelian, CPC, CPC-I, a healthcare consultant at Medco Consultants, who notes that although software has the capacity to identify Corrective Coding Initiative edits or bundled codes, it cannot identify the coverage determinations and regulations required to make the final code selection. Thelian points to her own auditing experiences when physician documentation did not adequately support the medical necessity of a service at the level indicated or when the software identified the word “physical” in one sentence and “therapy” in another and determined a physical therapy code was needed when that was not the case. Linehan predicts that in addition to more auditing to ensure accuracy and data integrity, coders will be managing more complex cases, leaving run-of-the-mill coding to CAC systems. That is why CAC will likely be limited to simple surgeries and common diagnostics—the bread-and-butter types of coding that are well suited to its capabilities, says Linehan. Coding for trauma and more complex cases will be managed by experienced coders, who will also find themselves in the role of mentor and educator. “We’ll be using the coders for the more advanced cases that involve little quirky things. Then the coders with more experience above that will mentor [new coders] to handle the more complicated surgeries. Then the ones above that will be the auditors and educators. They will educate the providers and coders and will be the ones who are working to make sure that we are in compliance, that everything the providers are doing is documented, and that we get reimbursed for everything to which we are legally entitled,” says Linehan. Whether the changes taking place in the coding profession will finally alleviate its decades-long coder shortage remains the subject of much debate. For example, ICD-10 will likely increase the demand for coders, particularly those with experience in the new code set. However, it will also create more opportunities that may bring new coders into the profession. At the same time, growing acceptance of CAC will help facilities deal with the near-constant coding backlog that has been the by-product of the coder shortage. It can also help current coders increase their skill levels to ensure they remain competitive in the rapidly changing world of HIM. Those coders who succeed in reinventing themselves to fit with their future profession will be the ones who emerge unscathed from the rapid renovations that will take place throughout the next decade. This means increasing their clinical knowledge, recognizing their new roles as educators and auditors, and ensuring they have a voice in the design of the new systems and processes being implemented as part of the ongoing automation of documentation and coding. For example, while many predict that it will be more common for clinicians to be coding on the front lines, it is the coder who has the experience and knowledge necessary to minimize workflow disruptions and maximum accuracy. What that means is that the coders of tomorrow will need to have extensive communication and analytical skills and the wherewithal to stay abreast of rules and regulations so changes can be communicated effectively back to the facility. They must also have the ability to implement those changes efficiently. “It’s a good field to be in over the next 10 years. There is more than enough work for everyone, but it’s going to be different,” says Thelian. To ensure they are regarded as credible additions to the clinical team, tomorrow’s coders will need a much higher level of clinical education, which may mean at least an MA or LPN degree. Pricher likens the changes underway in the coding profession to those she experienced early in her career when she was a certified public accountant, before personal computers, spreadsheets, and accounting software were the norm. In those days, an accountant had to be good at math and enjoy mundane tasks. Little time was spent on concepts and analysis because there wasn’t much data available. However, that changed with the influx of computers, which freed accountants to perform analyses, review best practices, and focus on risk areas and controls. Accountant jobs became more specialized, requiring a different kind of skill set entirely, one that was more analytical and could apply concepts, interpret cause and effect, and interact with people at all levels.